Leading marine propulsion equipment manufacturer requires Sales Manager to direct activities of company sales reps., manufacturer's agents, and distributors. We are a new division of a twenty-five year old, well known U.S. flag shipping company. The General Manager of this nine month old division must be highly motivated to make the division meet the corporate growth expec- tations. The candidate must have broad and extensive shipping management experience plus a strong background in breakbulk and/ or liner sales. Divisional offices are located in the central Gulf Coast area. Tug/barge and Carribean trade experience are highly desirable. We offer attractive compensation and liberal benefits plus participation in prof- its. We are an equal opportunity employer. New 250' x 72' x 16', Deck Cargo-crane barge, 5400 ST cargo, ABS, Maltese Cross Al-Barge, 2050 PSF deck, 19 watertight compartments, four ballast tanks, fuel tank, all kevels and tow- ing pad eyes are in recessed pockets, break- water and an anchor bill board, fast towing spoon bow, skeggs on modified stern rake. Low lease rates available. Similar 250' available in spring 1983. 210' x 60' x 13' 6", ABS Deck cargo-crane barge, 3000 ST cargo, 2300 PSF deck, 36" square spuds, fuel tank, 16 cpts. Two 180' x 60' x 12', ABS Deck cargo-crane barge, 2300 ST cargo, 3700 PSF deck in crane area, 36" square spuds, ballast tanks, fuel tank, 13 cpts. 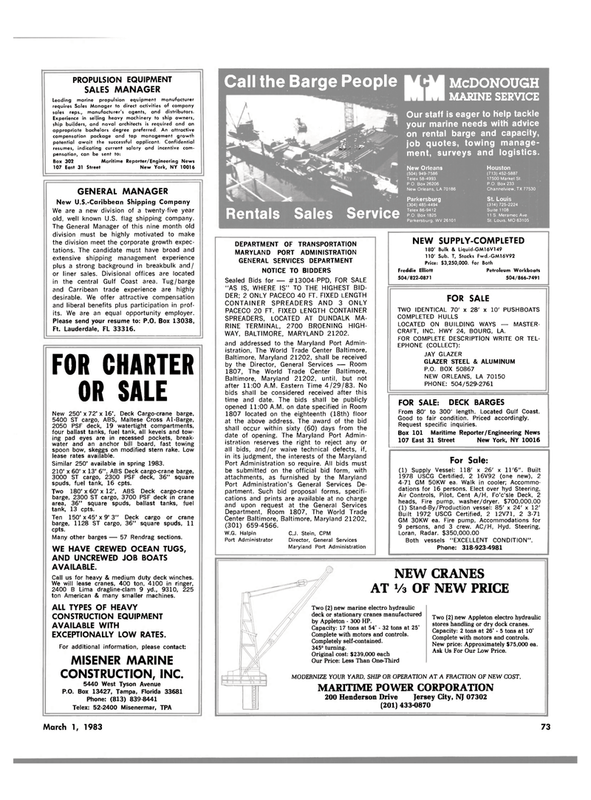 Ten 150'x 45'x 9'3" Deck cargo or crane barge, 1128 ST cargo, 36" square spuds, 11 cpts. Many other barges — 57 Rendrag sections. Call us for heavy & medium duty deck winches. We will lease cranes, 400 ton, 4100 in ringer, 2400 B Lima dragline-clam 9 yd., 9310, 225 ton American & many smaller machines. Our staff is eager to help tackle your marine needs with advice on rental barge and capacity, job quotes, towing manage- ment, surveys and logistics. Center Baltimore, Baltimore, Maryland 21202, (301) 659-4566. CRAFT, INC. HWY 24, BOURG, LA. From 80' to 300' length. Located Gulf Coast. Good to fair condition. Priced accordingly. Two (2) new marine electro hydraulic deck or stationary cranes manufactured by Appleton - 300 HP. Complete with motors and controls. Two (2) new Appleton electro hydraulic stores handling or dry dock cranes. New price: Approximately $75,000 ea. Ask Us For Our Low Price. MODERNIZE YOUR YARD, SHIP OR OPERATION AT A FRACTION OF NEW COST.